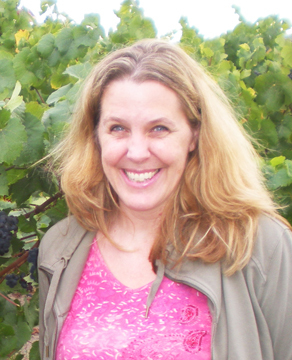 Cynthia Sue Larson in Sonoma, California. See Cynthia summarize this RealityShifters on YouTube video! "Don't rely on someone else for your happiness and self worth. Only you can be responsible for that. If you can't love and respect yourself - no one else will be able to make that happen. Accept who you are - completely; the good and the bad - and make changes as YOU see fit - not because you think someone else wants you to be different." I enjoyed watching the World Series baseball games this past month -- especially the players who managed to consistently stay calm despite the pressures of performing at their opponents' home stadium in front of thousands of people in a nationally televised game. Clearly, being on top of one's game requires not just skill, but also an inner quality of character that helps ensure a relaxed attitude, complete focus, good timing, and seemingly effortless flow. What kind of mindset brings us most readily to that optimal state of experiencing relaxation in the face of tremendous opposition, so we can maintain good timing and flow? When I reflect on this question, I get the answer: acceptance. Accepting ourselves as we are, and the world as it is, from a place of loving oneself even if other people might think of us as atypical, a misfit, or even a "freak." Attaining this kind of self acceptance that ensures an optimal blend of being relaxed, focused and poised is something each one of us can cultivate for ourselves, and it starts in a state of unconditionally loving oneself. We can take daily check-points of how we are feeling, in order to pay closer attention to how relaxed versus tense we are, how loving versus fearful we are, and how joyful versus sad we feel. Whatever we are feeling thus becomes a kind of set point, which we can observe and accept, noting things we would like to change in our lives that we have the ability to improve, and making a commitment to ourselves to make those improvements, always unconditionally loving and accepting ourselves just as we are, every step of the way. It turns out that this kind of openness and mindfulness is also the optimal approach to parenting, as Dr. Shefali Tsabary points out in her wonderful book, The Conscious Parent. When we embrace the totality of who we are, including our imperfections, we empower ourselves and those around us to be the best we can be at who we are. Would you like to view the video summary of this RealityShifters on YouTube? Feel free to check it out, as well as video shorts summarizing other recent RealityShifters newsletters. And remember to keep asking, "How good it can get?" every time you’d like to find out. Read the most comprehensive book ever written on the subject of reality shifts that describes what reality shifts are, why they occur, and how they can be used to influence and change your life for the better. Discover how to make the most of reality shifts in your life, how to live lucidly in a shifting reality, how to shift reality for healing, and delve into the quantum physics of what's going on when reality shifts. Read the first twenty pages of Reality Shifts here. "In REALITY SHIFTS, Cynthia Larson helps restore a sense of majesty and wonder to our everyday world. If you think science has explained away the magic of existence, you need seriously to read this book." "Ever wondered where that missing sock went when you last searched the clothes dryer? Thought about why those keys you so carefully tucked into your jacket pocket suddenly disappeared only to be found underneath the cushion of your favorite television sofa? 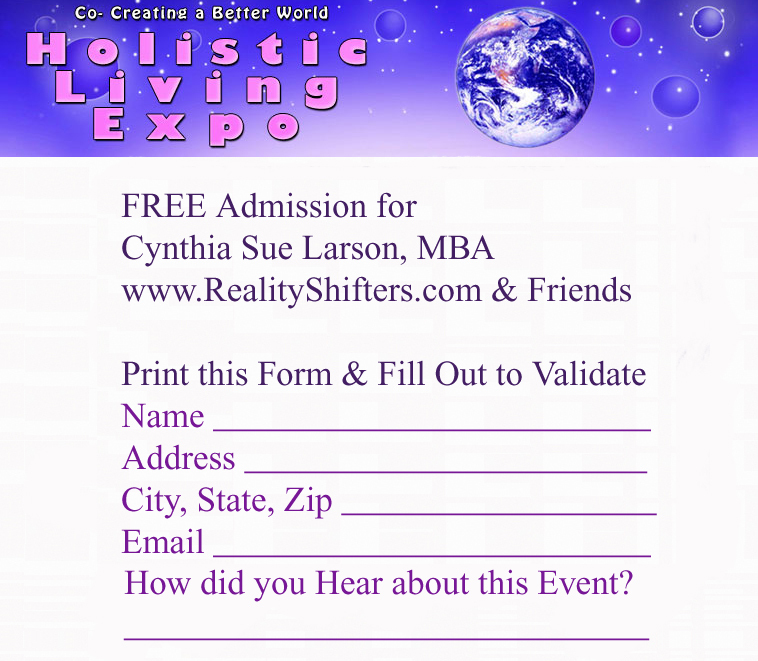 If so then you have experienced what Cynthia Larson calls a Reality Shift. 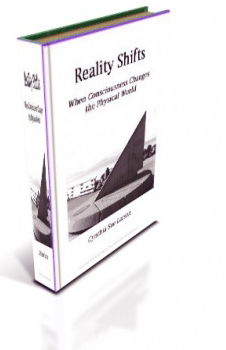 In her book of that title subtitled When Consciousness Changes the Physical World, she explains in clear and unambiguous language just what these reality shifts are, why they occur, and how they can be used to influence and change your life for the better. Larson even goes into how the latest ideas from quantum physics can help us understand these shifts and most importantly believe in them as part of our reality, not just our imagination. No, Martha, you are not going crazy, just witnessing the reality shift around you. I recommend this book for its clarity and for its message of hope. Readers will be encouraged to enjoy reality shifts both literally and in actuality-when they occur-and will be taught how to make them happen more often." 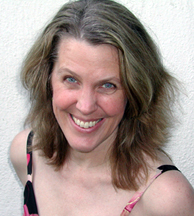 Cynthia will present a talk at 4pm on Energetically Clearing Relationships. Are you tormented by thoughts about someone? Utilize peaceful, positive techniques that can make tremendous improvements in all the relationships in your life. Discover how you can shift your reality in wonderfully amazing ways. Between 10am and 6pm, Cynthia will also be helping people get unstuck and shift their realities with private consultations. Cynthia Sue Larson will be a guest on Good Vibrations Radio Tools for Transformation with Solarzar & Kyralani on AM 540, KRXA, Monterey, California on November 20th, from 6:06 PM to 6:57 PM (PDT). The full show broadcasts from 6-9 PM (PDT) and can be live streamed on the Internet using the Live Link at the home page of www.GoodVibrationsRadio.com. To join in the discussion, listeners may call 1-831-899-5792 (KRXA). Love really can be a drug, according to new research at Stanford University that shows feelings of intense love can relieve pain. "Find things to give you pleasure in life, whether it be through the one you love or going and listening to great music or reading a good book," Dr. Mackey said. "It suggests that activating this intrinsic reward system ultimately can reduce your pain." How much better would our lives be if we could live in the White Queen's kingdom, where our memory would work backwards and forwords? In such a world, you could take an exam and then study for it afterwards to make sure you performed well in the past. According to a recent series of scientific studies by Daryl Bem, we already live in that world! Cynthia Sue Larson invites us to imagine how it feels to be influenced by the future, guided by our future selves... and how it feels when viewing past events through various lenses of perception. The concept of bi-causality, in which we influence both future and past events is considered from an experiential point of view. View the slides from Cynthia Sue Larsons presentation in Albuquerque, New Mexico on August 15, 2010. I just got your message about the "Vardogr" - amazing because I have experienced this as recently as Friday evening. I know I had one instance of this long ago when someone was on their way over to us, and I saw it. A man they brought with them was getting into advanced stages of dementia. They said that appr...oximately the time I saw it, he was saying "there she is!" in the car en route. At the time, my family was out of town visiting my husband’s mother. My Mother-in-law and I were in her den waiting for my brother in law to visit. He was bringing with him his wife, and at the time they were caring for her father who was elderly. As I sat across the small room from my Mother in law, I saw a whitish figure form for a moment in between us. I quickly looked at her to see if she would say that she had seen it too, but she didn’t, so I remained quiet. About 10 minutes later, my brother in law arrived with his wife and father in law, and we all started to chat. Her father would speak now and then, but was not really coherent. She discussed his state, and how she was taking care of him. As we discussed his state of mind, she mentioned that as they were driving over, about 10 minutes before they arrived, he suddenly said loudly, “There’s Katie Jo!” (my mother in law’s name). I realized then that it had been his astral form that I saw. I have seen figures like this before, and have felt that it was a spirit of someone that passed. I still think that sometimes that is the case, but this was the first time that I saw something that I realized had originated from someone living. Since opening to that idea, I have realized over the years that I can see thought forms that are emanated from people. It depends on how clear and complete the thought is. When they complete the thought, it is released, and I see it form spontaneously around their head. Now, the interesting thing about your newsletter is that I hadn’t thought of that incident at my Mother-in-laws house for a long time. It happened several years ago. Then Friday evening, the day before I received your letter, my 16 year old daughter walked across the street to get her books out of someone’s car. I was sitting in the living room looking toward the front hallway in front of the door, when I saw clearly a whitish figure moving from the direction of the door into the room about 2 or 3 feet, then vanish. As I was wondering what that was, she opened the door and came in. I truly believe in synchronicity and I think that you are able to tap in to these experiences. Thank you so much for giving a name to what I have seen. Note from Cynthia: What an amazing coincidence that you had a Vardøgr story at about the same time as it was featured in RealityShifters this month! Thanks so much for taking the time to write this down and share your experiences! I really love the way you're able to "connect the dots" and figure out a little bit of what's been going on when you've seen astral impressions of living people.... both in the form of thought forms emanating from people, and when they're thinking of being where you are. I like the connection you're making regarding the clarity of thought people have being important, as I agree that's true... some people are really "Loud thinkers", or perhaps more accurately, "Focused thinkers"! I wanted a painting of angels. I had just moved to NYC into a funky, but drab studio apartment owned by the hospital where I would be working. I took very little from my former residence in Ohio. My ex-fiancé turned friend drove me the 11-hour trip in Goldie, my gold Oldsmobile that I sold to him just prior to the move. Whatever fit into the car made the trip, and I set my intention to find some thrift store bargains to get me through the year. About a month into my stay, I found myself shopping, but this time for a spiritual community. I talked to the chaplains who came through the hospital sometimes, but I needed to be with other people. I was lonely, despite having little time alone. I was looking for music, looking for meditation, looking for God. I looked online and found a church that was about an hour walk from my place. I got myself up and made the trek from the Far East side to the far west. I walked past the warehouses of the fashion district and after a bit of wandering found the church. It was just what I was looking for, and though I didn’t stay to socialize afterwards, I knew I would be back. On my walk home, I remembered my painting of angels. I went by a bunch of stores, but nothing stood out for me. Then, in what looked to be a garage of an old warehouse, I spotted a flea market. I prayed before I went in to find my painting, though I wasn’t exactly sure what it would look like. I started at the end and made the loop around the huge space. There were the usual antiques and such, but I wasn’t interested. When I got to the end of the loop, I was a bit disappointed, but figured it wasn’t meant to be. Then, just as I was walking out, a vendor unloaded several paintings from his truck. Right in front was a beautiful picture of a barefoot woman holding a rose. She was surrounded by two chubby little angels whispering in her ears. I knew it was for me. The painting was marked forty dollars, but with my new NY bargaining skills, I got him down to the twenty-six bucks I had in my wallet. I didn’t know how to get across town on the train yet, so I walked my painting around town. It’s funny how I didn’t seem to notice all the scaffolding until my walk through with the angels. I was so happy when I arrived back at my place, that my arms weren’t even sore. I hung my painting above my futon as a reminder of the presence of the Divine. On my way back from church a couple weeks later, I looked for the flea market again, but it was gone. I asked many people on the street if they knew where it was, but was told there hadn’t been a flea market in the neighborhood for several years. It remains to me this day both a mystery and a miracle. I have moved several times since then, but the woman and her angels continue to travel with me. Recently, I relocated and unpacked my belongings. I looked at my painting and noticed that the woman had a scar on her elbow nearly identical to the one that I received many years ago after I wrecked during a bike race. I felt my angels telling me that though we all collect scars throughout life, we can always find help to heal and transform. There are so many things I can’t explain, but I have learned to keep my ears and heart open. I know when I listen; there is always the potential for new insights, opportunities, and help to appear out of “knowhere.” Perhaps this was the message of the flea market. And maybe somewhere along the journey through time and space, I’ll meet someone else, who has met their own miracle at the flea market. Note from Cynthia: What an amazing experience, and how inspirational to find such a meaningful angel painting at a flea market... that is there when you get the painting, and then gone! The angel painting seems so much more valuable for the way it came into your life in such extraordinary fashion. I used to work at Caltech in the mid-eighties as supervisor of publications, and I enjoyed eliciting theories about physics from the faculty. At that time, we still had physicist Richard Feynman, terminally ill with leukemia, who used to wander around campus. I was amazed that someone else has had the same experience with their guide and was able to see him. I too have had a guide for over three decades who helps me with my work. I spent 14 years learning to become a surgical illustrator but the actual move home to work as a self employed medical/surgical illustrator to be with my kids became a nightmare. Before the computer I missed the ability to walk across the medical campus to use the medical library or discuss my assignment with a peer. As staff medical illustrator I was able to observe surgeries. Alone in my studio I began to bite my nails and pull my hair while trying to figure out how to create some very challenging work. Even today I would be challenged to illustrate an atlas of cardiac surgery! So I began to pray and seek guidance. However, I was unaware of spiritual teachings, guides, space and time belief systems, etc. All I could conjure up was prayer. Shortly after my first prayer I was reading a book in bed when a very handsome red headed man, from his waste up, wearing a navy blue suit, white shirt and red tie, appeared beside me. I was not afraid as he offered me his hand which he insisted on holding for about 10 minutes. During that time he told me, not in a physical voice, all of the things I must do to receive the information I needed for my work. He related that over a few weeks I was to sleep like a cat with all of lights on in my clothes because a long sleep would leave me groggy and unable to remember all of the information being fed to me. I remember taking tours of the body, similar to "Fantastic Journey", and observing cardiac surgeries. When drawing, my hand would create beautiful and accurate images that seemed not only accurate but aesthetically pleasing. I persisted on redrawing the same drawing in my old style. However, the ones done with guidance were the ones selected so I discontinued to duplicate a drawing without assistance. Some of my surgical clients, over the decades, have marveled at the accuracy and wonder how I could capture their procedures without observing or having years of surgical training. I take it for granted that this is how it should be. I also feel I have merged with this guide and the ocean of knowledge. This experience has also propelled me into exploring spiritual teachings. I remember illustrating a the Theory of Chaos books with one of the Caltech professors, a very young full professor, who felt that he also had a guide. When I asked him how he received all of his voluminous information he told me that he played a lot of golf. Now that I look back on my work at Caltech time I realize that those who have gone before were very actively working on the other side and handing down their findings to those who could receive. I remember when laparoscopic surgery came over from France in the early 90's, my guide had to go back to school to brush up on that type of surgery before he could disseminate it to me. It feels like we laugh and play all day while working...like you said, no ego gets involved. This also applies to many of my younger surgical clients. We play through our work and end up with great surgical text books. The old generation of ego driven physicians are are mostly a thing of the past. I can finally relate this story to an understanding audience. Note from Cynthia: Thank you so very much for sharing your marvelous account of how you have worked with spiritual guidance! I especially appreciate the way you noticed how the drawings you did from guidance had a special quality to them that could be felt by others, too.... and also the way your guide needed to do some investigation before you began drawing newer surgical procedures, such as laparoscopic surgery. And what marvelous advice to anyone working with guidance, to do something akin to the advice to "play more golf"! A relaxed and receptive mind is much more open to new information. Quite recently, I emailed you regarding a very mysterious situation. I have a Bible with an old photo of my mom when she was young - before I was born. In this photo, a man ohter than my father was twice seen in that picture! After I looked at it a third time, it changed back to a picture of my father and mom! Can time be altered then correct itself? If yes, then how come this time wave of change did not affect or change me? Thanks for the email about the mysterious situation with the photo of your mother with some other man... and then back to your mother and your father. I have seen changes in photographs that vanished off a roll of film (back when there were such things as rolls of film)... and yet even with such big changes, I did not observe any identifiable changes in myself. I would hazard a guess that while we may think we are unchanged, in truth, we are changing all the time. We know this to be true in the sense that our bodies are aging, of course, and in the event of a reality shift, it's likely that our consciousness makes the trip from one reality to another so seamlessly that we find ourselves in a parallel universe and accept our body there as being our own. Yet, it is possible for us to witness miraculous healings in our physical bodies in such shifts, such as instantly healed organs, skin, and bones! If you're seeking quick and easy ways to change your children's behavior, or get them to do what you say, this book is not for you. Becoming a conscious parent requires looking deeply and honestly within oneself, delving into one's own fears and shortcomings. The Conscious Parent invites parents to become more mindful of their daily interactions with their children so that rather than seeing children's actions as "misbehavior," parents can recognize an opportunity to be kinder and more open themselves. The central premise of The Conscious Parent is that children provide parents with mirrors of their own subconscious issues, and parents who understand this can enter into a state of heart-to-heart communion with their children, learning and growing alongside their children, rather than continuing habitual reactive patterns that tend to perpetuate family cycles of power, control and dominance. As author Shefali Tsabary points out, this shift from an egoic state of mind to one of authentic being "... isn't an easy one for a parent to make." While much of the Conscious Parent contains the kinds of tips and pointers Tsabary provides for her clients, this book really shines when Tsabary shares her first-hand experiences as a mother. Parents seeking ways to bridge the gap from parenting similarly to how they've been raised and achieving a Zen-like state of mindfulness in parenting will delight in the examples and suggestions Tsabary shares for how they might actually manage to incorporate some of the lofty ideals of mindfulness to parenting, and how it feels as a parent to deal with one's own internal doubt, fear, and resistance. Tsabary discourages parents from using praise and scolding to mold children into doing and being what most pleases the parents, and recommends that parents grant their children the freedom to become the best they can be at who they truly are. Tsabary suggests that parents can set high standards in some areas, such as for: speaking from their authentic voice, being kind, expressing feelings directly, helping others, and engaging in daily dialogue and conversation with them. The Conscious Parent is highly recommended for readers dedicated to living their lives mindfully who are eager to have functional, rather than dysfunctional families. This book inspires parents to set examples for children by embracing imperfections, and staying open-hearted, open-minded, and truly present and engaged. If all families adopted just some of the ideas from this book, it seems clear that the world would be a much better place. Over 6,400 RealityShifters Subscribers live in 84 different countries around the world -- with the majority in the United States of America, Canada, the United Kingdom, Australia, Africa, New Zealand, India, the Netherlands, Malaysia, Mexico, Italy, Sweden, Germany, Brazil, Belgium, Singapore, South Africa, the Philippines, Japan, Norway, Ireland, Denmark, Spain, Israel, and Panama.